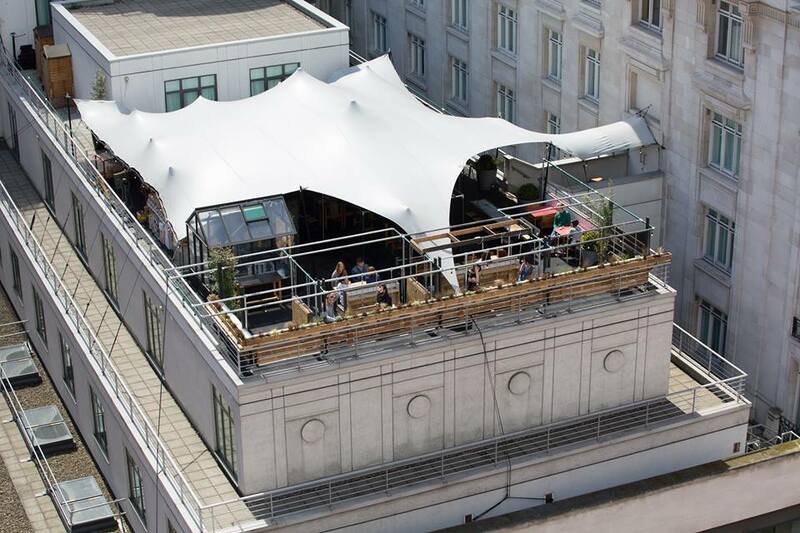 Notch is a new rooftop bar at 535 Oxford Street - almost opposite Marble Arch. Last year there was a bar called Roofnic in this spot, but Notch is brand new for 2016 - you can watch them building it on their Facebook page. Expect lots of cocktails, pls food from Mark Morrans (Kurobuta), and it's open from 10am - 10pm every day for the summer of 2016. it's even got wifi to make instagramming easier (or pretending that you're actually at work...). Got to be done! "Practically opposite Marble Arch tube station, Notch stares down Oxford Street, from the top of the Marriott Hotel. Emphasis is on drinks, with the likes of pre-mixed Negronis, Old Fashioneds and the Adonis (red vermoth, sherry and bitters) on hand – all classic mixes, and all excellent – which are stored colourful tins resembling vintage tuna cans. There are also a number of freshly mixed summer cocktails, including the Red Pigeon (tequila, campari, lime, pink grapefruit, sugar) and the Humming Bird (gin, elderflower, lavender, apple, lemon, sugar). Cocktails cost £8. Food comes courtesy of a small shack manned by Mark Morrans (Kurobuta, Nobu Melbourne), who's devised a menu which includes sea bass ceviche, fried chicken with marinated kimchee mayo and pulled beef with anticucho drenched short rib, anticucho mayo and pickled cucumber. Food is served from midday until 10pm. Regardless of the weather, Notch will be open seven days a week, from 10am until 10pm, and has Wifi on site."